The statistic shows Pandora's active users from 2009 to 2017. At the end of fiscal year which ended on December 31, 2017, the online radio and music streaming service had 74.7 million active users, down from from 81.1 million two years earlier. In 2016, the cumulative listener hours for the streaming service reached almost 22 billion hours, marking the highest to-date. Pandora's revenue also hit a record high in 2016, with the company generating over 1.38 billion U.S. dollars. Pandora Internet Radio is a part of the Music Genome Project that provides a music streaming service as well as music recommendations. The Music Genome Project uses 450 attributes to describe a song and an algorithm that organizes a wide range of music. Currently, Pandora is only available to users in the United States, Australia, and New Zealand. 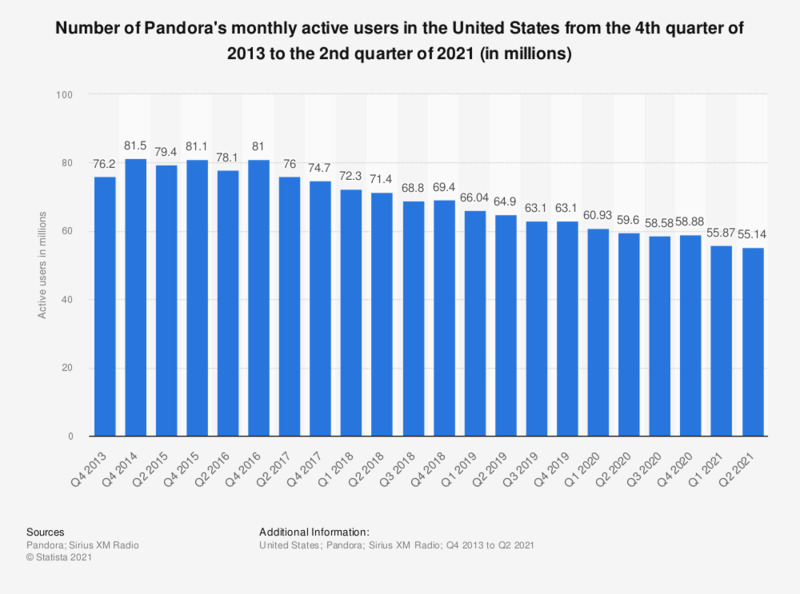 Since its launch in January 2000, Pandora Internet Radio has vastly increased its number of active users. As of December 31, 2016, Pandora boasted 81 million active users. In comparison, Spotify hit the 100 million user mark in June 2016, although this streaming service is also available in most of Europe and South America, parts of Australasia, and various other countries in the world. Through the Music Genome Project, Pandora does not focus on genres of music, but interprets qualities of melody, harmony, rhythm, form, composition, and lyrics to determine music recommendations for its users. As a unique source of music, Pandora is used by almost a third of consumers monthly and almost a quarter use it weekly. In recent years, as Pandora has become more successful, the company’s revenue has reflected its broadening market. In the financial year 2016, Pandora’s revenue totaled 1.38 billion U.S. dollars, a figure which has risen sharply on an annual basis since the company’s launch. Pandora currently obtains most of its revenue through advertisement, subscriptions, and directing users to purchase music through Apple and Amazon. In 2016, the company's advertising revenue exceeded one billion U.S. dollars for the first time. On September 24, 2018, Pandora was acquired by Sirius XM Holdings. As of February 2019 there are no updates on Pandora's active users for the 2018 period. Active users are defined as the number of distinct registered users that have requested audio from Pandora's servers within the trailing 30 days to the end of the final calendar month of the period. The number of active users may overstate the number of unique individuals who actively use the service within a month as one individual may register for, and use, multiple accounts. Figures for 2009 to 2016 come from a earlier financial releases. Until January 2013, Pandora's fiscal year started in February and ended in January of the following year. Starting with January 2014, Pandora's fiscal year will start on January 1 and end on December 31 of the same year. The period between February 1, 2013 and December 31, 2013 is a transition period.